Chris Hardy led his side to a 4-1 win on Saturday at Marine to ease their recent away day woes. Paul Connolly takes us through five things we learned from the victory. Saturday saw the devastating link-up between Tymon and Carson pay off to full effect. Much like last weekend’s home victory over Skelmersdale United, the pair linked up to cause no end of problems for Marine. The pair were involved in each of the four goals, both contributing two each, with a Tymon chip and Carson thunderbolt being the pick of them. Carson’s runs from midfield complements the style that Tymon plays, and allows him hold up to pop the ball off to his teammate and advance the play. With the relationship on the field just developing, it’s exciting to see how much they could bring to the side as a link-up. Chris Hardy revealed post-match that his side had been working on taking chances in training, after the Skelmersdale United game, and it paid off. 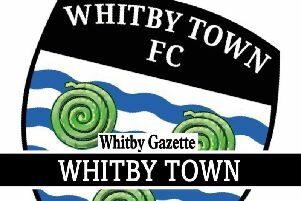 Across the game, Whitby had six shots on target, four of which found the back of the net. Every time Whitby went forward, they looked as though they were going to score. As well as this, they looked clinical from the outset, scoring within ninety seconds, thanks to David Carson. Refreshingly, Whitby didn’t look scared to have a go when in advanced positions and it showed the firepower that is at the club’s disposal at this current time. Despite Hopson missing out through illness again, it would have been a perfect afternoon for the Blues’ top goalscorer. Marine played on a good pitch, and allowed Whitby time and space to impose their passing game. Add Dale Hopson into the equation, and Whitby could have romped well past four goals, with his top-class vision and finishing. Hopson is expected to return to full fitness within the next week, although with a performance like that from the side fresh in the memory, he may struggle to fit back in straight away. Over the course of the afternoon, both wing-backs got forward with their usual energy levels and caused problems. This constant running paid off, with a fantastic assist, on the half-volley, from Daniel McWilliams, to aid Tymon’s first goal of the afternoon. Most of Whitby’s success came from the wide men feeding the central attack, something that Hardy has put focus on over the course of the season. Although we’ve seen some brilliant performances this season, this is definitely up there with the best of them. From start to finish, Whitby looked hungry from one to eleven, and proved that they are still a serious play-off contender, despite recent blips. Couple this with some excellent team goals and excellent football, the Blues made their task look far easier than it should have done. With the business end of the season approaching, the Blues now need to use this as a psychological boost to take into the remaining five away games to gain key results, particularly at the likes of Nantwich and Blyth, while also maintaining their excellent home record.